TOPEX/Poseidon (T/P) was an altimetric mission jointly collaborated by NASA and CNES (French space agency). It launched 10 August 1992 and began data collection on 25 September 1992. T/P operated until 18 October 2005 and collected 481 cycles of data. T/P was capable of measuring significant wave height, sigma naught (sigma0), dry and wet troposphere and ionosphere, which can be used to calculate sea surface height and anomalies and total electron content. T/P had a repeat period of approximately 10 days with 254 passes per cycle. T/P began a drift maneuver 15 August 2002 cycle 365 pass 111 and ended 16 September 2002 cycle 368 pass 171. During this time T/P moved to a different orbit so that T/P and Jason-1 (which remained on the original T/P orbit) would survey the Earth in a shorter amount of time and give a higher spatial resolution. Lists of cycle start times, maneuvers performed to maintain orbit, sateholds and periods of no data collection are provided in the "Related Links" sidebar. NRA – Dual frequency radar altimeter that measures in the Ku (13.575 GHz) and C (5.3 GHz). It measured altimeter range, sigma0, significant wave height and ionospheric correction. It was the main sensor for T/P. TMR –TOPEX Microwave Radiometer measures the 18.7 GHz, 23.8 GHz and 34.0 GHz sea surface microwave brightness temperatures. The 18.7 GHz channel provides the wind induced effects in the sea surface background emissions correction. The 23.8 GHz channel measures water vapor. The 34.0 GHz channel measures the cloud liquid water to be corrected. All together the three frequencies provide the error in the satellite range measurement caused by pulse delay due to water vapor. SSALT – Solid State ALTimeter operated at one frequency (Ku band, 13.575 GHz). Since it was a single frequency and external ionosphere correction needed to be supplied. SSALT shared the same antenna as NRA so only one altimeter was able to operate at a time. GPSDR – Global Positioning System Demonstration Receiver operated at 1227.6 MHz and 1575.4 MHz. It used GPS differential ranging for POD. TOPEX-A altimeter operated from cycles 1-235. In mid 1997, it was determined that there was a degradation in the point target response which impacted the significant wave height. In February 1999, TOPEX-A was turned off and the redundant backup input altimeter, TOPEX-B altimeter, was turned on. Subsequent calibration to assess the data resulted in keeping TOPEX-B on for cycle 236 and all subsequent cycles. Cycle 235 was the last cycle using TOPEX-A. 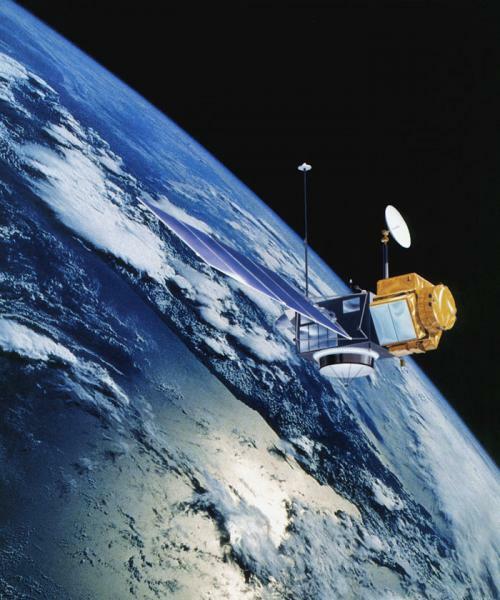 From cycle 1 through cycle 8 pass 189 (23 September through 8 December 1992, day of year, DOY, 343), the satellite attitude control system was not properly calibrated. This resulted in pointing the altimeter relatively far from nadir (typically 0.3, but up to 0.6) with a sinusoidal signature over each pass much of the time. Since the pointing angle/sea state corrections are less accurate for angles larger than about 0.3 and the geometric pointing correction cannot be done, these data will be less accurate than later data. The pointing calibration was improved on 1992 DOY 353 and 357 and 1993 DOY 046, but these changes were minor compared to the initial calibration on 1992 DOY 343. The user may want to begin analysis on data beginning with cycle 11. A list of calibrations for the TOPEX backscatter can be found at ftp://podaac.jpl.nasa.gov/allData/topex/L2/gdr/docs/sigma0_calibration/. The calibrations are provided to improve the sigma0 values provided by the project that are found in the GDRs. If you are using the MGDRs, the calibrations have been applied to cycles 1-132, otherwise you need to apply the calibrations to the other cycles yourself. If you are applying the GPC correction to the GDR, it contains the calibration corrections. Additional information about instruments, orbit or other properties of TOPEX/Poseidon can be found in the Handbook.